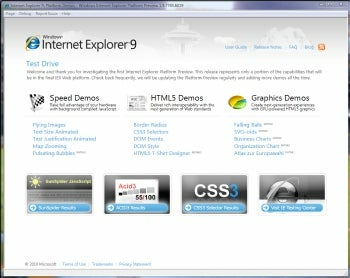 Microsoft's next-generation Internet Explorer 9 browser may not be anywhere close to competition, but you can test drive a "platform preview" of the software that provides a taste of IE9's capabilities. So what's the deal with Redmond's upcoming browser, and how does it differ from IE8 and worthy competitors such as Google's Chrome, Mozilla's Firefox, Opera Software's Opera, and Apple's Safari? Here's a quick primer. How Does IE9's Interface Look? It's too early to say. Since the Platform Preview isn't a compete browser, it's not a good indicator of IE9's final fit and finish. However, given the growing popular of Google Chrome, a streamlined browser with few menus to befuddle users, there's hope that Microsoft will give IE9 a cleaner look and feel. So What's the IE9 Platform Preview? The Preview is primarily a way for Web developers to test their sites and see how they can implement HTML5's capabilities, Microsoft says. Redmond plans to release a new Preview version every 8 weeks or so. Can I use it in Place of My Regular Browser? No. The Platform Preview isn't a fully-functional browser. There's no back button, for instance, or an address bar. It opens links in your default browser, not the Preview app. In addition, some of the features may or may not appear in the shipping version of IE9, depending on feedback from Platform Preview testers. Any Particularly Cool Platform Preview Features? Will the Preview Run on My PC? Yes, if you're running either Windows 7 or Vista. On Vista, however, you'll need to install Internet Explorer 8 (if you haven't already) and the Platform Update for Windows Vista, an OS upgrade that allows Vista to use some Windows 7 technologies. And while the IE9 Platform Preview comes only in a 32-bit x86 version, it'll run on 64-bit Windows 7 and Vista PCs too. I'm Running Windows XP. What About Me? Sorry, you're out of luck. The GPU-powered graphics of the IE9 Platform Preview rely on display driver enhancements first introduced in Windows Vista. When Will IE9 Be Ready? It's not clear. Microsoft plans to release a beta version of IE9 after feedback from Platform Preview users indicates the technologies are ready for everyday Web browsing. Again, with roughly two months between Platform Preview releases, it's a safe bet that a shipping IE9 is still months away. What Features Will be in the IE9 Beta? Microsoft isn't saying. Obviously, however, the features highlighted in the Platform Preview, including support for HTML5 and other Web standards, will be a cornerstone of the new release.